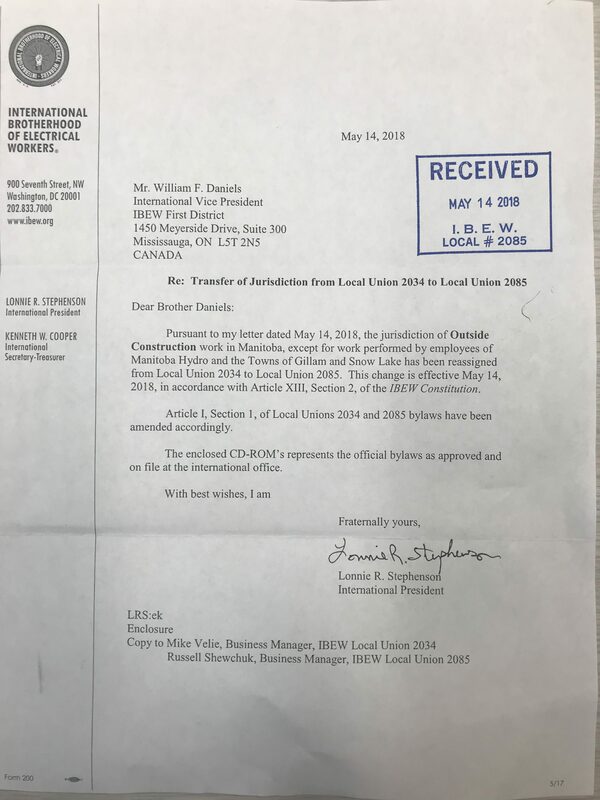 On Monday, May 14th, 2018, IBEW Local 2085 received the official transfer letter from President Lonnie Stephenson for the Outside Construction Jurisdiction. Historically, since our original Charter on October 1st, 1960, Local 2085 had complete jurisdiction under the IBEW Constitution of having both the Inside and Outside Construction Jurisdiction. What this meant, in the most simplistic terms was that “we did it all, from a battery to a lightning bolt.” Local 2085 was clearing the right of way, erecting transmission towers, stringing lines, erecting poles building power dams, and substations for the entire electrical infrastructure of Manitoba. For unknown reasons, the IBEW Local 2085 Business Manager of the day transferred the jurisdiction to IBEW Local 2034 in 1999. 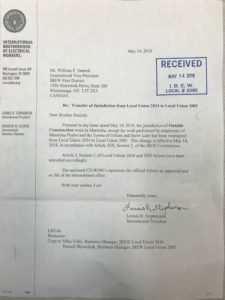 Although the transfer was filed away at the International office, the contractor’s association (CLRAM) that Local 2085 deals with was not aware a transfer took place. Fast forward to 2012, and the construction Riel Converter Station, Local 2085 was geared up to provide all manpower to build the first phase. At the pre-job meeting prior to construction, manpower supply was agreed to by myself, as the acting Business Manager and the management of Black & McDonald. After the first four months of the project, Black & MacDonald decided to move a new management team in place from Ontario and change the arrangements that were previously agreed upon. Black & Macdonald sought out a separate deal with Local 2034 to lower costs as the company asked the question, who holds the jurisdiction for Outside Construction in Manitoba? The answer they were given at the time, was IBEW Local 2034. For the last 6.5 years a disagreement of sorts developed with the CLRAM as they felt it was Local 2085, not Local 2034 that should be controlling this work, as Manitoba hit the largest hydro construction boom since 30 years prior. 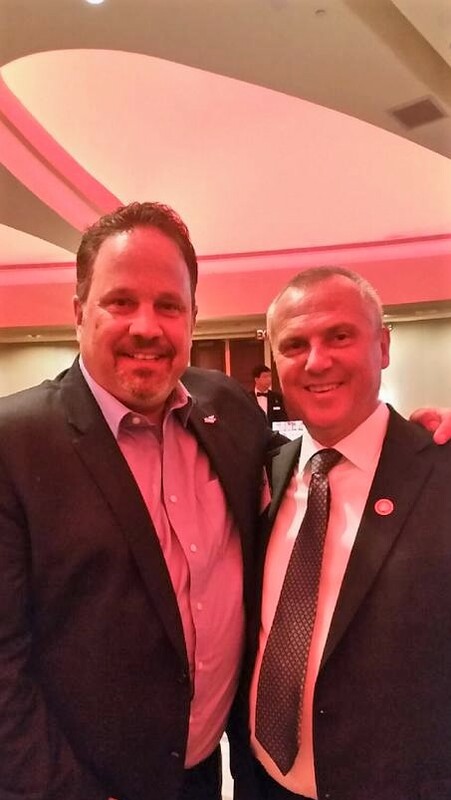 Numerous meetings were held with the International First District over the last few years to try to find the best solution possible for the IBEW to gain control of this expanding construction market. On April 12th, 2018, I met with International President Lonnie Stephenson in Washington D.C. for a final meeting to decide who will manage this jurisdiction of work. At this meeting President Stephenson did a review of our most recent projects, manpower dispatched, hours worked, contractors signed, organizing, training, membership development and the overall growth and financial stability of Local 2085. We were also strongly complemented about the adoption and implementation of our IBEW 2085 Code of Excellence program. With this transfer, IBEW Local 2085 will be developing a new collective agreement for our Transmission Line division. We have meetings set up next month with contractors that are seeking to bid and secure work in this market. We will also be meeting with Manitoba Apprenticeship to implement a training program. Of course, this will take some time to develop going forward but with this outside jurisdiction, we are pleased that we will create new opportunities for our members, that wish to achieve a dual ticket (Red Seal) as a power line technician. Looking ahead we have an extensive amount work to do, and together we will grow this market. With this new jurisdiction obtained this past week, IBEW Local 2085 just became the largest Inside/ Outside Local in North America covering the geographical area of Manitoba and Nunavut. That Brothers and Sisters, is something we should all be proud of.